Since I come from an advertising background, I’ve been patiently waiting for the numbers… Yes, the ratings! I want to know how did we do. Did we deliver? Well, the ratings are in and before you stroll down below, there are a couple things you should know. First of all, the Futon Critic explains that “Ratings are designed to see how many people are watching the commercials on a TV show, you know, the things that pay for the TV shows in the first place.” So, it’s not a measure to see how many people “liked” the show or how many people really watched it. It’s NOT about the show; it’s about the advertisers who paid to be advertising in the show. The audience who watched the show online, or in big groups (like here at my casa –we had a big Thanksgiving group of people) don’t count. Also, what doesn’t count are the repeats of the show (which my episode ran like 7 times throughout the whole weekend). Another thing to note, is that Cable Network TV and Prime Broadcast Network TV are not measured together. I don’t think we stood a chance against Charlie Brown…lol. 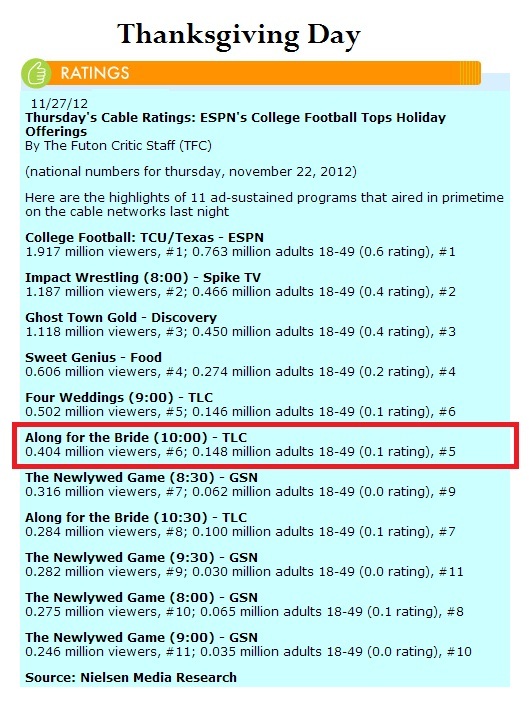 Anyway— The results for the episode “Aki” Along for the Bride on TLC. We made the charts!!!!! Whooo—hoooo! The breakdown; What does it mean?